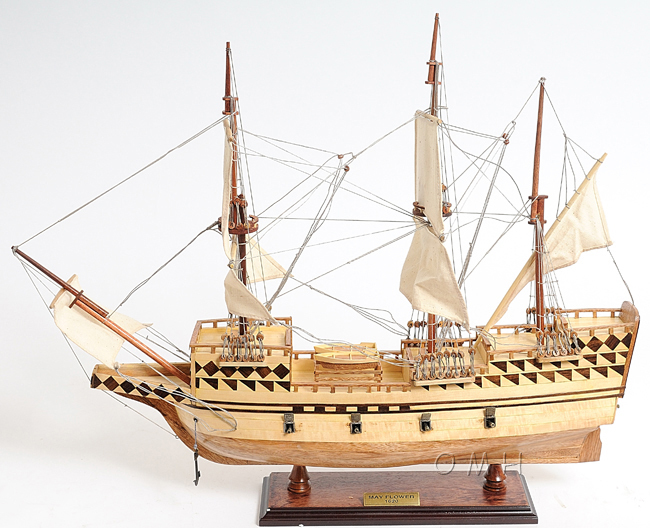 Product Dimensions (L x W x H): 31" x 9" x 25"
Display this May Flower replica in your home or office!, a ship that in 1620 brought the Pilgrims from England to New England. This May Flower model features one row of ferocious cannons on each side of the ship. The front bowsprit and three large masts are connected securely using advanced rigging and lines painstakingly knotted and fastened by hand. Each yard has an attached hand-stitched unfurled sails made of fine linen. Metal anchors and a wooden rudder are visible on the front and rear of the ship. On the deck, there are authentic hand-built lifeboats with ribs and planks and other handcrafted ornaments. This model comes standard with a solid wood base and brass nameplate. The masts and sails are folded down for easy shipping. Itll make a perfect gift for home or office decorator, boat enthusiast or passionate collector. The Mayflower brought the first group of Pilgrims to North America in 1620. As originally conceived, the expedition included another vessel, the Speedwell, but the latter proved unseaworthy. The Mayflower, about 180 gross tons and carrying 102 passengers, finally got under way from Plymouth, England, on September 16, 1620. The ship was headed for Virginia, where the colonists had been authorized to settle. As a result of stormy weather and navigational errors, the vessel failed to make good its course, and on November 21 the Mayflower rounded the end of Cape Cod and dropped anchor off the site of present-day Provincetown, Massachusetts. No one knows exactly what the ship looked like, but it was probably about 27 m (90 ft) long, had three masts and two decks, and probably weighed about 180 tons.